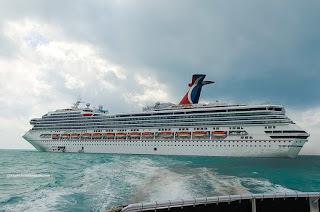 Okay, I'll be completely blunt on this one - I have always been afraid to take a cruise with Carnival. What??? Afraid??? Yes, I was one of those people who bought into the negative hype about the company. We've been on Celebrity (2X), Holland America (3X), Princess, Norwegian (2X) and RCCL (2X), but never Carnival. Finally, I decided it was time that I made my own conclusions by taking a cruise aboard the Freedom sailing from Galveston, Texas. As expected, the cruise was reasonably-priced and in fact, less expensive than all of the aforementioned companies. For myself and Viv with the kids in a quad-room, it cost roughly $2800.00 Canadian dollars including port charges and taxes for the March 24th, 2018 sailing. So far, that has been the lowest price we've paid for cruise outside of a special we had for our Alaska cruise aboard the Celebrity Mercury in 2006. 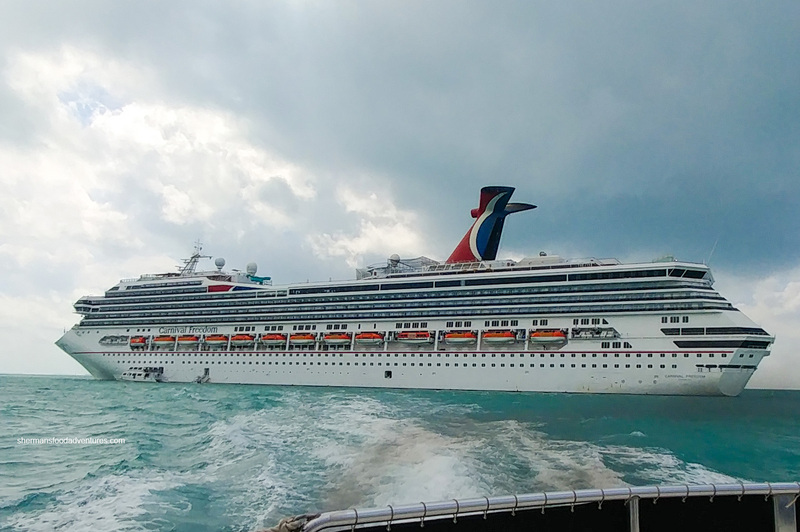 Carnival has tried to streamline their embarkation process by allocating a 1-hour time slot for people to arrive. In theory, passengers would arrive in waves so that the port would not be overwhelmed. We had the 11:00-11:30 embarkation time and it only took us roughly 20 minutes from arriving at the port to boarding the ship. There was no long lineup to speak of, except there was one for those who missed their time slot or arrived too early. Something that is out of Carnival's control, but was still slightly a hassle was the distance of the Galveston cruise port from Houston. We took an Uber from Hobby Airport and it took over 30 minutes while if one was to travel from George Bush International, it would be over an hour (without traffic). We could have stayed overnight in Galveston, but the hotel rates were quite high. If one wanted to rent a car and drop it off in Galveston, there is only one option in Enterprise. They are fully aware of this, hence their pricing is downright outrageous. Another option would be to drop off your rental car in Texas City which is only a 10 - 15 minute taxi or Uber ride to the port. 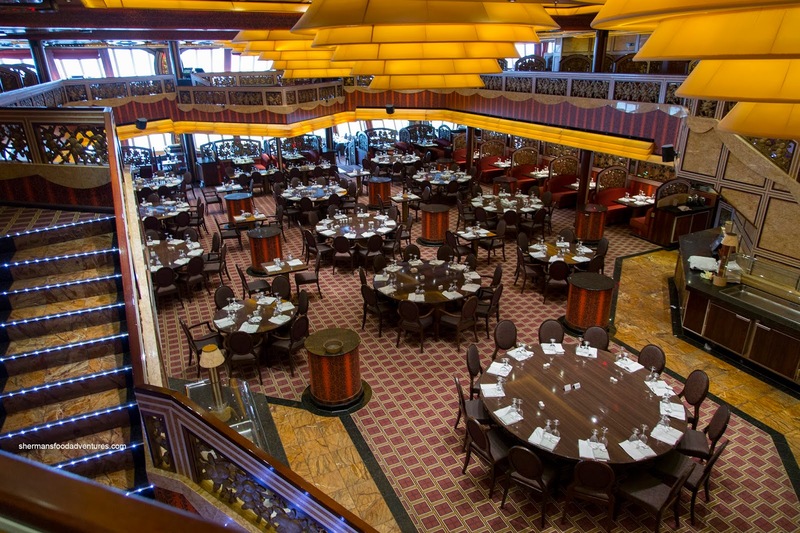 Once onboard, we made a quick beeline up to the Freedom Restaurant which is on the Lido deck aft much like any other cruise ship. 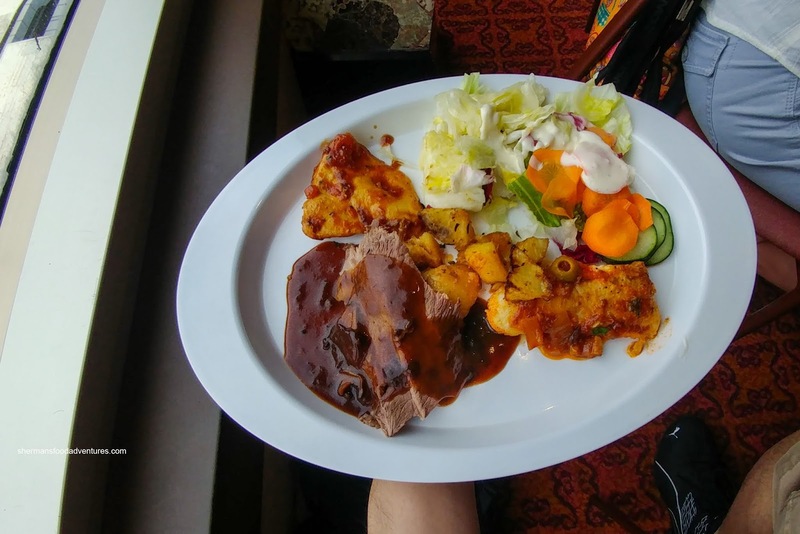 The buffet had several different stations including comfort food, Mongolian wok, deli, sushi and a rotating theme section (Italian for lunch this day). I wouldn't say that the comfort food was anything to write home about, but it did the job and there were some highlights. 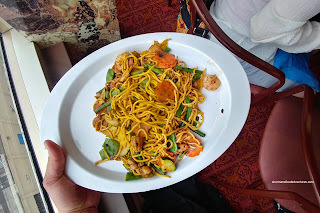 The Mongolian Wok was a good choice for freshly-prepared food (rather than something sitting in a chaffing tray) that sported veggies, noodles, meats and sauces. Overall, I thought it was pretty good as it wasn't greasy and the food came out hot. Impressively, the meats were cooked just right including the buttery shrimp. The deli featured the usual sandwiches including turkey, pastrami and corned beef. Hot dogs as well as bagels with smoked salmon and cream cheese were available as well. 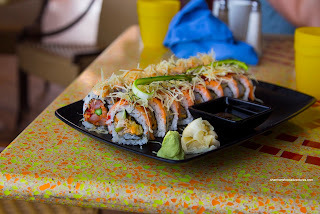 Although the sushi required a surcharge, we thought it was good since it was pretty legit. The only negative was the dessert bar as the textures seemed a bit off. 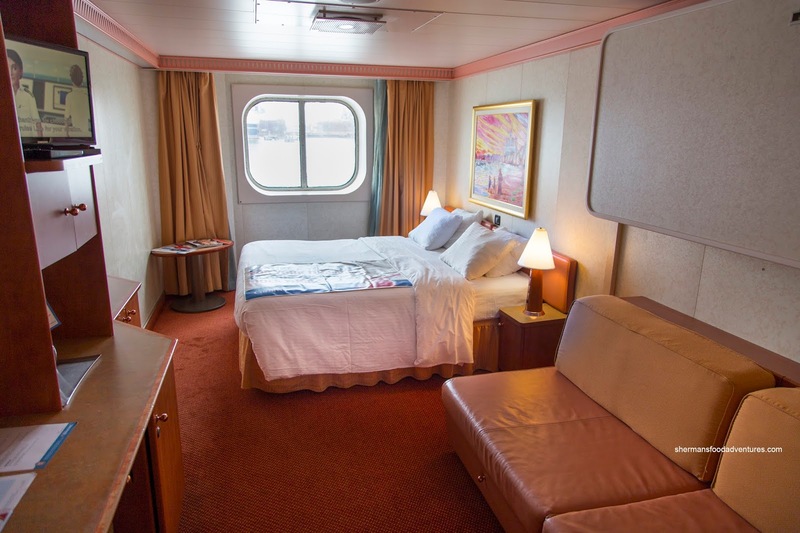 After lunch, our Stateroom was available at 1:00pm. 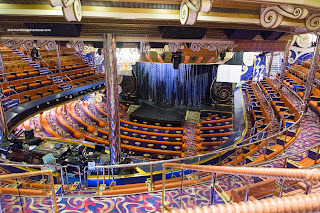 We made our way down to the room (#2355) on the Main Deck at mid-ship. This was a good location since it was close to the mid-elevators. 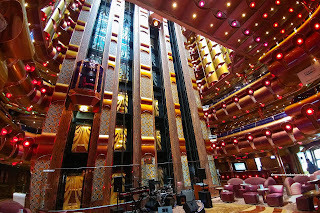 However, with the Chic Restaurant sitting on floors 3 & 4 above at mid-ship, it prevented us from moving from one part of the ship to another without either walking down the hallway on 2 or above at 5. Back to the stateroom, it was fairly spacious with plenty of space to maneuver around the bed and between the vanity and sofa bed. The quad configuration saw a pull down bed just above the sofa bed to create a bunk bed-like arrangement. Again, this didn't impeded our mobility within the room and I much prefer this over the pull down beds above the main bed. 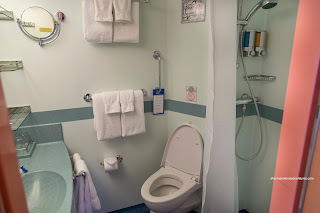 Common with older ships, there was only one A/C plug in the room and one in the washroom. Be sure to bring an power bar or something similar to plug in multiple electronics. 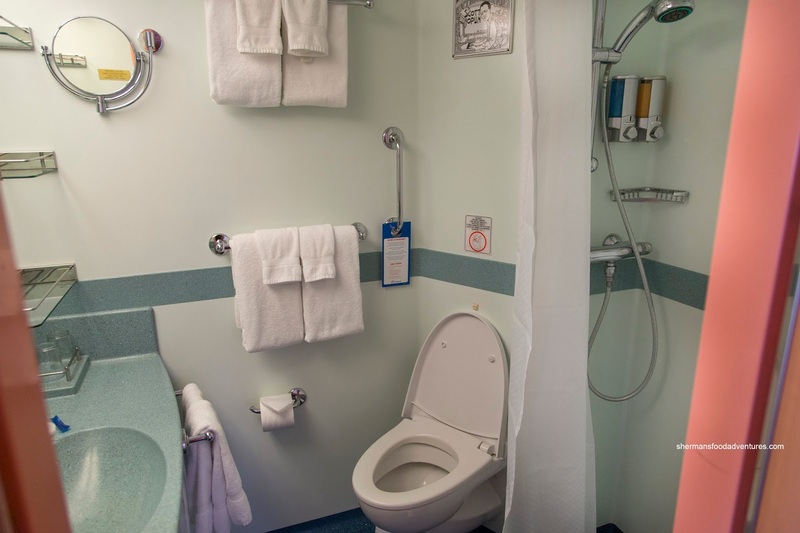 About the washroom, it was also standard with the usual stand-up shower featuring a dispenser with body wash, conditioner and shampoo. The room was kept in pretty good condition with only a few parts with wear. Our cabin steward and assistant were attentive in making the room 2 times a day. Whenever we needed something, he was quickly responsive. We weren't too keen on the pink accents in the room, but it wasn't a deal-breaker. Storage space was good with the standard row of closets near the front door as well as the cabinets at the vanity and 2 night stands. There was even storage underneath the sofa bed. I particularly liked how the fridge was empty, so we could put our own beverages and other items into it. 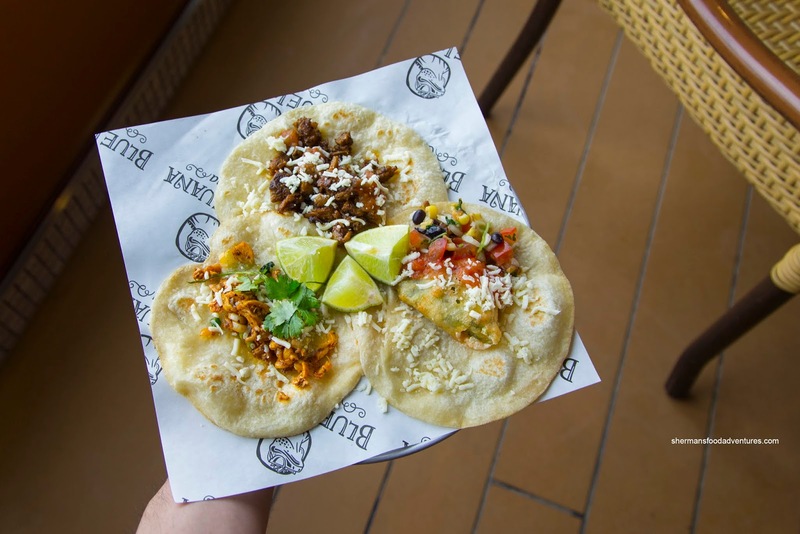 Many cruise lines fill it with their choice of beverages that are for an extra cost. Overall, we slept well as the beds were a good combination of being firm and comfortable. Although we were never too warm, the A/C in the room was a little weak when we were in warmer temperatures. 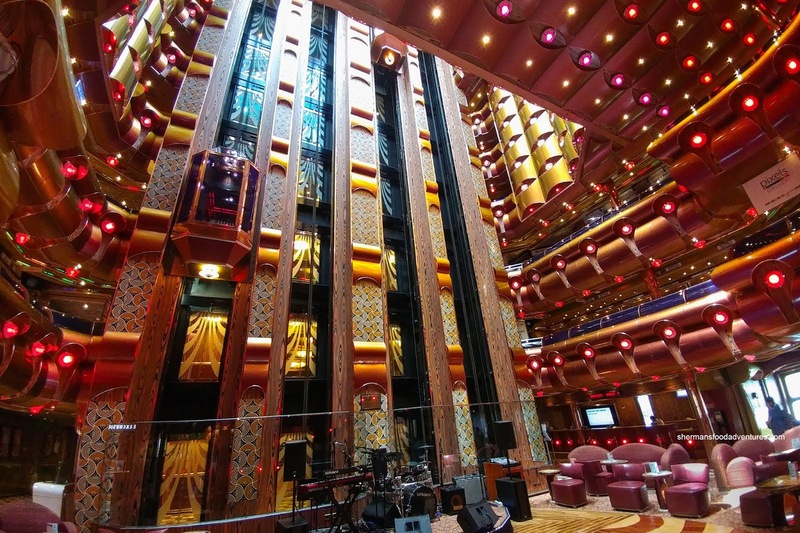 In terms of the public spaces aboard the ship, the Millennium atrium felt a bit compact, but was never difficult to navigate through. We sat at the bar and there was natural light from the above. 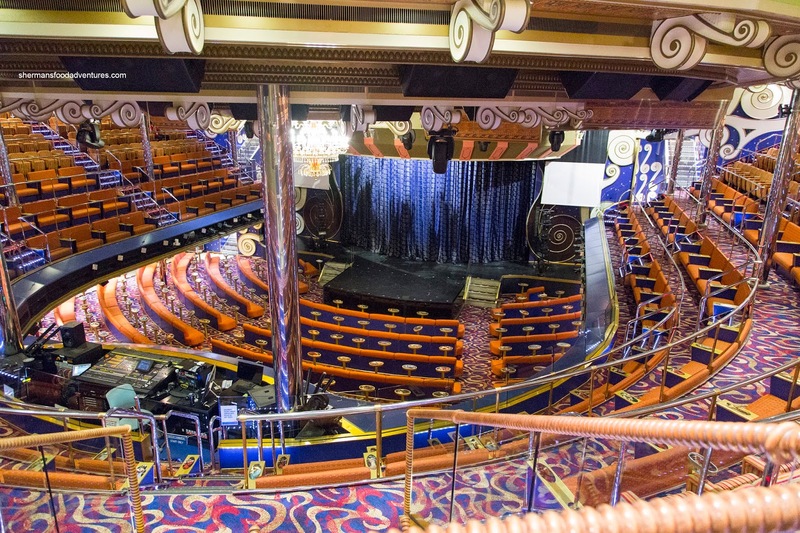 This was used extensively for trivia and other games during the cruise. Just in the background of the picture, you will see the front desk, which was pretty calm. However, most of the time, there was a lineup down the hallway. That is pretty standard aboard cruises as people have various inquiries, but that made for quite the bottleneck. 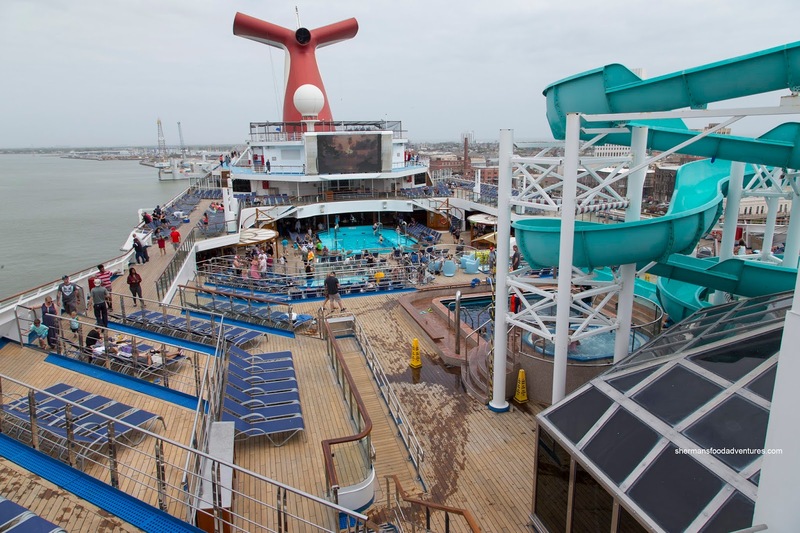 Other public spaces were not too bad, but deck space was at a premium during sea days and movie nights. Due to the various choices for food (at no extra charge), lines were manageable and according to people I asked, walk-ins for dinner at the Chic dining room were not a problem. 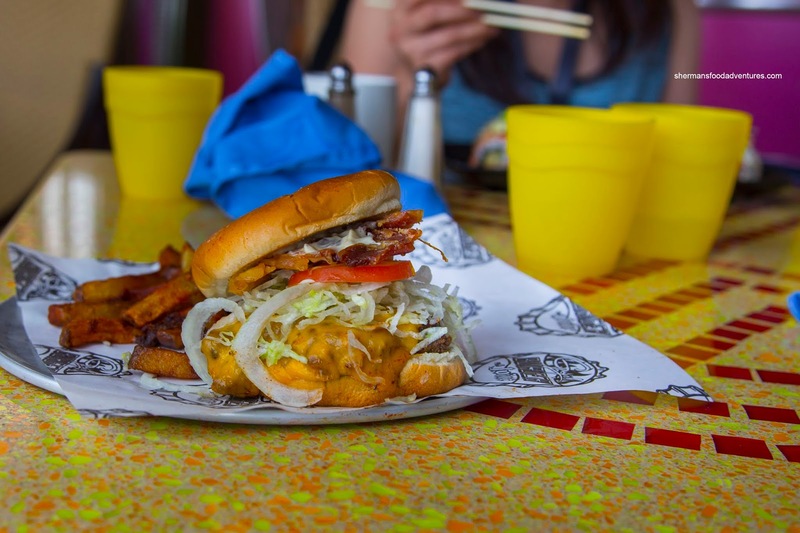 Remember I mentioned part of my fear with Carnival was with the mediocre food? Well, I have to take that back. For the most part, the food in the Posh main dining room was good. Even though I did dine at the Sunking Steakhouse for $35.00 extra per person, I thought the steak in the main dining room to be tender and prepared to my specifications. I will go more in depth with each dinner service in the next 7 posts. Onto more casual dining options, Guy's Burger Joint was pretty enjoyable with meaty, well-seared patties. Plenty of customization options available too with a DIY bar consisting of sauteed mushrooms, fried potato sticks, caramelized onions and so on... Also on the Lido deck, the Blue Iguana Cantina offered up freshly made tortillas (like made from scratch) with 3 meat options for tacos and burritos. There was also an option for taco salads in a taco shell bowl. 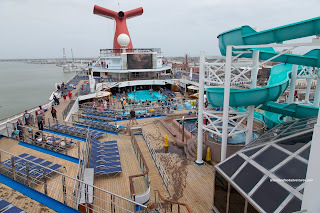 At the aft of the Lido deck, we found the adults-only pool where it was a bit quieter than the main pool area. The 2 food options available were pizza and seafood. The Pizza Pirate offered up fresh made-to-order thin crust pizzas. The fresh pizza dough was made from caputo flour and the tomato sauce was from San Marzano tomatoes. For those who aren't familiar with Neapolitan-style pizza, these 2 ingredients are pretty legit. The result was a uniformly crispy crust with a tangy sauce. In addition to the classic Margherita, there was funghi, prosciutto & arugula, 4 cheese and pepperoni. 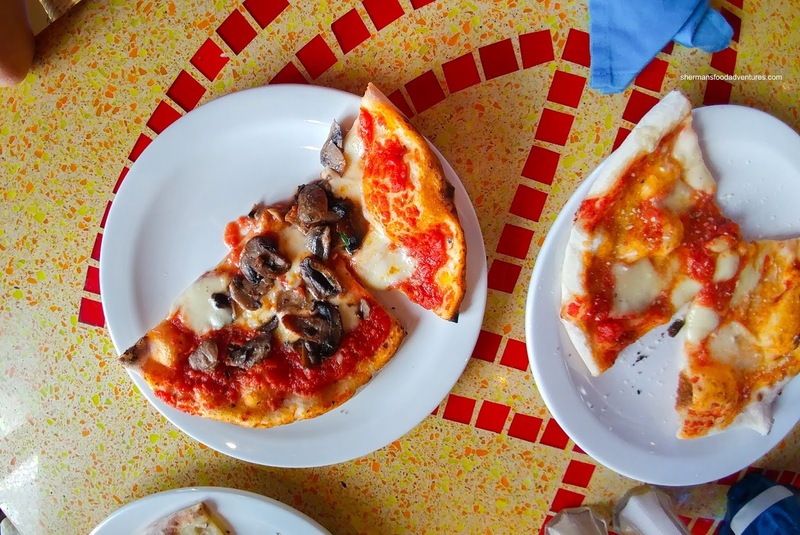 Lineups were common at The Pizza Pirate, but I didn't mind as it meant the pizzas were always hot and fresh. As mentioned above, there was also The Deli, which served up made-to-order sammies, smoked salmon bagels and hot dogs. 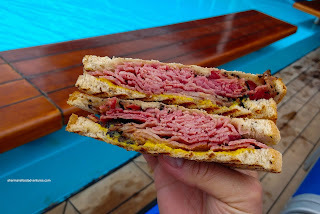 I had the Montreal Smoked Meat a few times and for a cruise, it was pretty good with tender smoky and fatty meat. 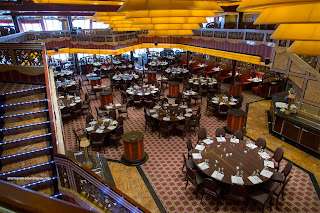 Over on the port side, The Seafood Shack was one of the few pay restaurants aboard the Freedom. 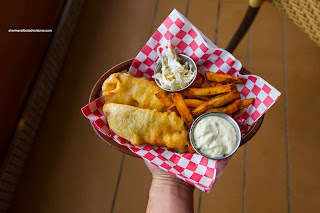 We decided to try a couple of items including the Fish & Chips (since my daughter really wanted it...). In terms of the fish itself, the preparation was on point being flaky, moist and tender. I found the batter a bit inconsistent where some parts were crunchy while the middle was too soft. The fries were excellent being hot and crispy. 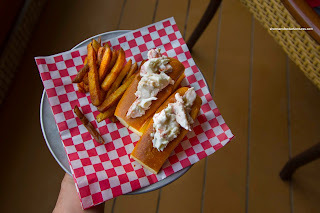 For myself, I tried the Lobster Roll served as 2 mini-portions. Although the roll was nicely buttered and seared on the flattop, I thought it was too dense and not warm enough. However, the lobster (without any other fillers) was texturally perfect having a sweet briny snap. It was dressed in a mild-tasting mayo. Although we thought the 2 items from the seafood shack were solid, it isn't necessary to deviate from the free options as they are just as good. 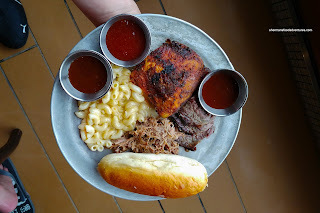 As if there weren't enough options already, there was a BBQ Restaurant above the buffet with a menu that offered up BBQ Beef, BBQ Chicken and Pulled Pork with sides of Mac n' Cheese, Coleslaw, Potato Salad and BBQ Beans. We went there twice during the cruise and although it doesn't compare to the awesome BBQ I had in Texas, it was more-than-acceptable. In fact, the BBQ chicken was super tender and juicy. The skin was nicely rendered and spiced while the chicken itself tasted good. If that wasn't enough, we could choose from 3 Guy Fieri BBQ sauces (Brown Sugar, St. Louis and Sriracha). The BBQ beef was decently tender with a light smoke while the pulled pork was decently moist. It did need BBQ sauce for full flavor though. Due to complete apprehension, we left the Sushi Bar to the end. Moreover, it was at an extra cost. But it turned out to be solid with chewy sushi rice and carefully constructed rolls. Definitely an option if one is tired of all of the heavier choices. Since Carnival caters mainly to a younger crowd and families, there was more than enough activities to keep everyone busy. In addition to the usual kid's programs, we found a large arcade, mini-golf and many planned activities in our daily schedule. The shows in the Theater were decent with an enthusiastic cast featuring a few strong singers. The set design was quite modern. Our cruise director, Malcolm (who moved onto another ship as of this writing), was friendly, energetic and a great host. 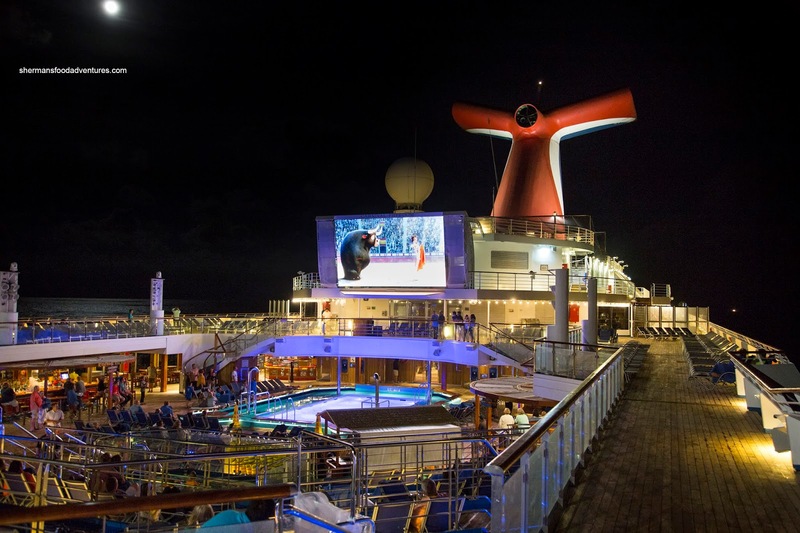 One of our favorite activities was watching Thor: Ragnarok up on the Lido deck. Literally, we were watching a blockbuster Movie with the waves splashing against the ship and the sea breeze around us. And if you look at the picture (Ferdinand was playing that night), we could also gaze at the stars and moonlight. They even had fresh popcorn. For all the times I avoided Carnival, I bought into the negative hype. A lesson learned, do not listen to the media, go with your own experience.